One of the products listed below is the mystery Jackpot item for today. If you order the mystery Jackpot item, you will receive the Ribbon Rounds™ Organizer (retail value of $16.95 US/ $19.95 CAN) for FREE! Order one of each of the items below to guarantee that you will hit the Jackpot! This is a great price on stamp sets! Shop My CTMH Website for this great deal today only! Yesterday’s mystery Jackpot June item was …the School Zone Level 1 Kit. If you purchased the School Zone Level 1 Kit on my CTMH website yesterday then you received the Flower Metal-Rimmed Tags for FREE ($13.95 US / $16.50 CAN)! I bought these drawers at Michael’s. 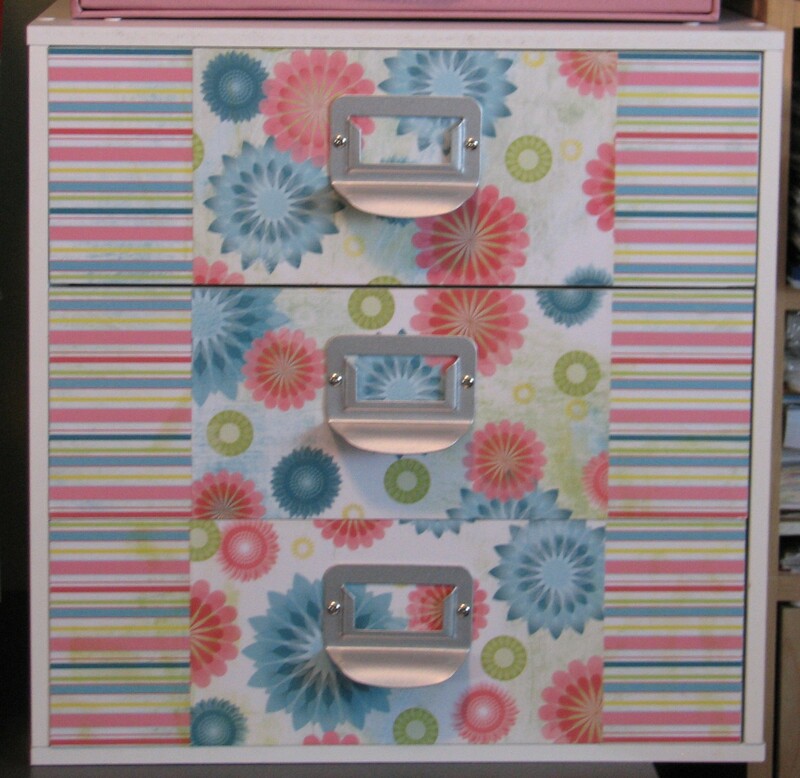 Dh was putting them together when I came up with the idea to decorate the front of the drawers. I made him stop and I covered them with paper before they were put together (much easier!). Since the photo, I’ve added rhinestones to the top of the screws and I still need to make labels. The papers are CTMH Tickled Pink (a special kit from awhile back). Supplies used are all CTMH unless noted: Zippidee Level 2 Paper Packet, Holiday Buttons, Black Hemp, Badge Buttons, Tinkerin’ Level 2 Stickease, Simple Stitches stamp set, Cocktail Alphabet stamp set, black ink, black & colonial white cardstock, Zig marker, and Cricut Plantin SchoolBook cartridge. The challenge this month at Scrap Our Stash is to stitch on your layout. Be sure to check it out and enter your own project for the month. I love the look of stitching and there are so many ways to achieve it. You can, of course, use your sewing machine. (This is actually the only sewing I have ever done – on paper!) Or you can poke holes with your paper piercer and connect them with a marker, use a marker to make “dashes” that resemble stitching, or what I did on my layout – stamping. The CTMH Simple Stitches stamp set is one of my favorites. It is faster than actually sewing and because the stamps are acrylic the are very easy to line up. 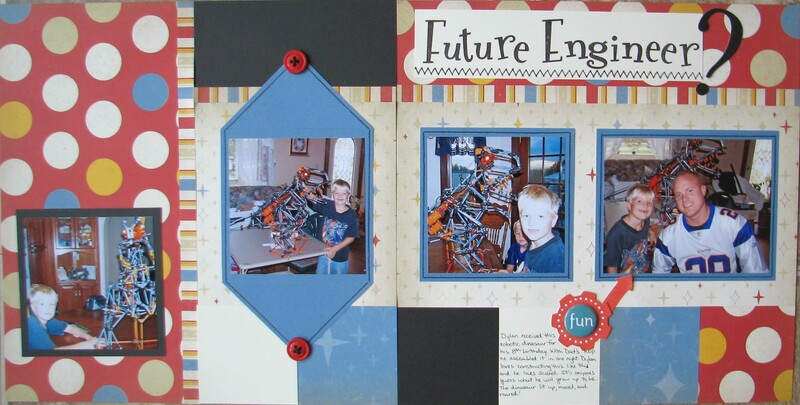 I created the look of stitching on the title as well as around all the blue photo mats. It is a great look for any layout and often adds the perfect extra touch.